Howdy, partner! 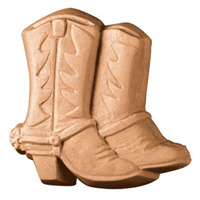 Cowboys and cowgirls alike will love the Boots and Spurs Soap Mold. Perfect for cleaning up after ropin’ some doggies or fixin’ a mess of vittles. For all wranglers that never learn without getting dirty the Cowboy Soap Mold is the answer. 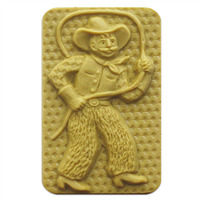 This soap bar depicts a cowboy with a lasso out on the ranch. Giddy up! 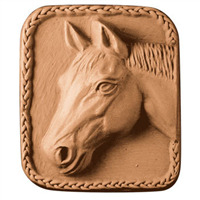 The Horse Soap Mold features the head of one of these equine superstars, surrounded by a braided frame. It’s perfect for ranchees, horse fans, and people who can quote The Godfather verbatim. Bar Depth: 1.5" Bar Length: 3.25"
FACT: Horses became domesticated around 3000 B.C. FACT: The average American girl will draw 3000 pictures of horses between the ages of 7 and 9. 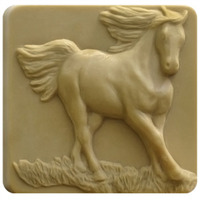 The magnificent equine featured in our Running Horse soap mold is perfect for horse lovers. 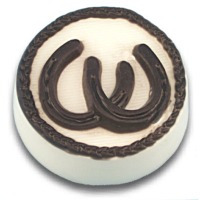 Bar Depth: 1.25" Bar Length: 2.75"
Often thought of as a symbol of luck, the horseshoe soap mold makes a great gift for anyone, especially those who love horses! The circular mold has two crossing horseshoes and a rope-like border. Invite this striking mold into your collection and watch it sneak into your favorites. (We promise there are no Greek soldiers hiding inside.) 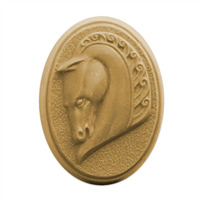 The Trojan Horse Soap Mold is an intricately detailed, classic cameo horse head, designed to represent the power and grandeur of the ancient equine.